We’ll finish your job in its entirety and make sure you are 100% satisfied before we move onto another roofing installation in Orillia, ON. Have you ever had a home improvement project done, and the work crew came and went throughout the day numerous times? If so, that most likely indicates they didn’t have enough skilled craftsmen to go around, and they had multiple jobs going on at once. It is their attempt to make sure none of their customers gets nothing done in a day, which would be noticeable, but that doesn’t mean you got the service you expected. With our team at Slippery Slope Roofing, your roofing installation is handled as if it is the only one we are working on – because it is! We take in jobs and schedule them for one at a time. We’ll finish your job in its entirety and make sure you are 100% satisfied before we move onto another roofing installation. 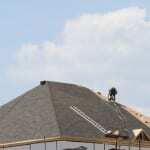 That is just one way we are different from other roofing installation companies out there. We also make sure that all our work is done exactly how the material manufacture requires it in order to honour their warranty. This is a huge benefit to you because lower-quality roofing installation companies leave you holding the bag when something goes wrong. We don’t do that because we do the work properly, so you should never have a material manufacturer deny your claim if their product were to fail. Among other things, we excel by keeping a clean work area. While we are doing your roofing installation and at the end of the job, you will barely know we were there in that regard. We can’t do much about the noise involved, but we can keep your yard from looking like a war zone or a severe storm struck. When you want a roofing installation that has professional results and dedication to your job first, give us a call. We’ll make the roofing installation for your Orillia, ON home an exceptional experience– guaranteed.